OpenXCom is currently available for TftD, with a new beta build every night. OpenXCom for a beta build of OpenTFTD, an open-source restoration project. The Collectors Edition ("Gold") is Windows native and, thus, wont run in DOS. 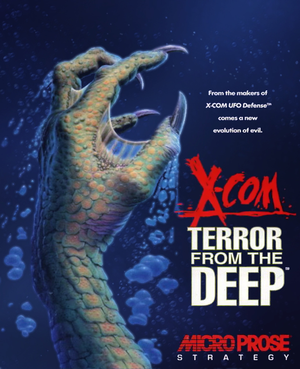 Beta builds of TftD are compatible with both XCOM: UFO Defense as well as Terror form the Deep. New beta builds are released every night. Patch 2.1 and the beta geoscape patch will update the game to the latest. Be sure to apply the 2.1 patch before the beta geoscape one, which is actually the latest patch despite it's name. It should be noted that the CE version and digital versions use the 2.0 patch only; it may be beneficial to install the 2.1 which fixes a research tree bug. However using the geoscape patch with CE is impossible unfortunately as it replaces the game executable, which it only provides in DOS form. TFTD Extender is CE version only. XcomUtil however works on both versions. If you only have the DOS version you can replace some of UFO Extender's functionality with BaseFixer: info on getting Python working in DOSBox is available here and a modified linker for XcomUtil 9.7+ integration can be found here. The TFTD Extender program runs on the Windows version, providing a mouse-resizable window, a smoother-running, more responsive screen than DOSBox, and a host of fixes for various bugs or exploits in the game.. It also supports the use of higher-quality .mp3 music from the PlayStation release, and keyboard shortcuts. XcomUtil provides bug fixes, including for the disjointed-base bug, and additional ease-of-use features like the automatic re-equipping of soldiers before a mission and appending rank and stat info to soldier names. Download the UFO Extender loader "TFTDextender.zip", available at this Ufopaedia page, and extract it directly to the folder "TFTD", which is inside the base installation folder (e.g. "Terror from the Deep") in distributions with DOSBox. In the "TFTD" folder open TFTDExtender.ini, find "D3D=0" and change it to "D3D=1" and change the value of "D3D Windowed" from 0 to 1. Save and close the modified .ini file. If you do not wish to install XcomUtil as well, stop here, and you may run the game by launching "TFTDLoader.exe" in the "TFTD" folder. Download the XcomUtil install file, currently "XcomUtil 9.7 Beta-442.exe", available at the downloads page at Bladefirelight.com. Run this file, again directly selecting the "TFTD" folder as the install location. If unavailable, use this .zip file for build 442, extract it into the TFTD folder. Note that XcomUtil does not officially support TFTD yet so you need to download this mini patch and extract it to the the "TFTD" folder and then run XcuSetup.bat. The patch is old so you may have to rename TFTD Extender's exe to "TFTDLoader.exe" for XcomUtil to detect it properly. If you want to change these options, run setup again by launching "XcuSetup.bat" in the "TFTD" folder. You can also do this after starting a game. You may now launch the game by running "RunXCom.bat" (not "TFTD.bat") in the "TFTD" folder. Set additional UFO Extender options as you see fit by altering TFTDextender.ini with Notepad. Information can be found here. In the provided download, all options are off by default, including enhancements that do not affect gameplay. You may enable Geoscape and Battlescape keyboard shortcuts and the stat display on the equip screen by setting the appropriate "Apply" values from 0 to 1, and set the keyboard shortcuts. To use the enhanced music from the PlayStation version of the game, download the appropriate .mp3 files found [hhttp://openxcommods.weebly.com/downloads10.html here] (right-click and select to save the links). Place them together in a new folder inside your XCOM folder. Name the new folder "mp3". Open "TFTDExtender.ini" with Notepad and under the "Music" heading set "Apply" from 0 to 1. Set the track names to match those in the new mp3 folder. It is recommended to turn off the extender's warning messages with it's included ss.exe as they can be rather annoying and show up often when transitioning from geoscape to tactical mode. Create a file called cdspeed.dat and place it in the SOUND\ directory. Only relevant on a hard disk install of the game (CD installs always use videos). Digital version already have this tweak applied. Same as above, but use email instead of sneaker net. The Research tree bugs can generally be fixed by using TFTDExtender of XcomUtil. If you are reluctant to use these you could try the TRTBAG instead. Some digital versions of CE shipped without their MIDI sheet. Copy these into the sound\ directory. ↑ 1.0 1.1 File/folder structure within this directory reflects the path(s) listed for Windows and/or Steam game data (use Wine regedit to access Windows registry paths). Games with Steam Cloud support may store data in ~/.steam/steam/userdata/<user-id>/7650/ in addition to or instead of this directory. The app ID (7650) may differ in some cases. Treat backslashes as forward slashes. See the glossary page for details. This page was last edited on 26 April 2019, at 09:18.